Yellow high-density polyethylene shell, supported by a stainless steel outer rail, permanently attached with stainless steel semi-tubular rivets. Features molded runners, fully exposed outer rail, non-absorbent foam pad secured to stretcher and four patient restraint straps. 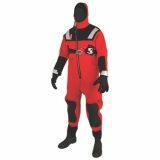 Ideal for unusually rugged rescue situations such as industrial, mining or construction. Patent Pending. DIMENSIONS: 84-1/2" L x 24" W x 7-1/2" H WEIGHT: 31 lbs. LOAD CAPACITY: 1200 lbs. 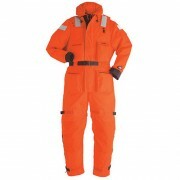 Stearns "The Challenger"" Anti-Exposure Flotation Coverall "
"The Challenger" Stearn's Anti-Exposure Work Suit - USCG approved Type V with SOLAS reflective tape - Sizes S-XXXL - Colors Org, Org/Blk, Green Offers 100% sealed seam integrity for hypothermia protection and comfort. Made with double layer of durable nylon fabric in seat and knees. Urethane-coated, exterior storm flap has hook and loop tape closure over heavy-duty zipper.